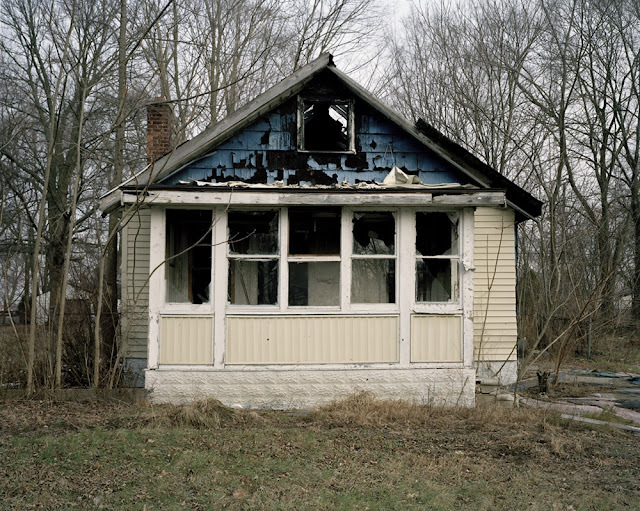 Photographer and filmmaker Eve Morgenstern has been traveling throughout the United States documenting abandoned homes — monuments to the human impacts of financial crisis. Her "Facades of Crises" photographic series recently appeared at the Bildmuseet in Sweden. She also makes videos on the aftermath of foreclosure for the Department of Housing and Urban Development (HUD) and the Federal Reserve Board. Her current project is a documentary about an Ohio town bought and bulldozed by a polluting power plant. I interviewed her about her experience as a documentarian of foreclosed homes, and about the role of art in periods of economic crisis. 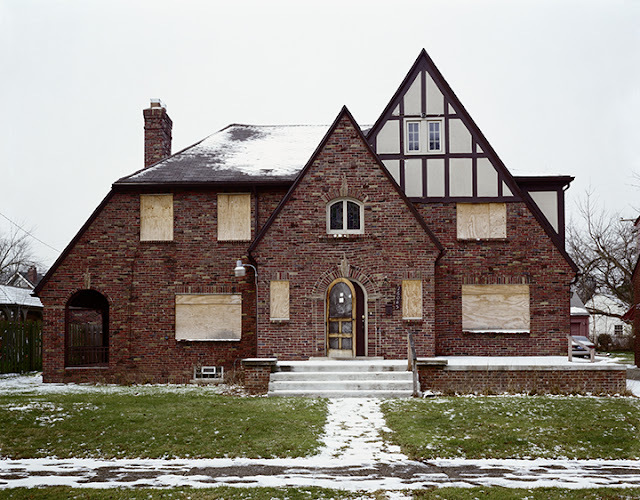 A vacant house in Detroit, where decades of economic decline and population loss have produced about 90,000 abandoned homes. How did you begin documenting foreclosed homes? I began photographing homes in 2007, when I was studying at The San Francisco Art Institute. I was focusing on the beautiful Victorian facades of homes in Oakland and began to notice foreclosure signs and plywood going up over windows and doors. This was really when the crisis was beginning, and I became more and more interested in documenting these homes. When I first pulled up a map online and saw the densely clustered red dots that signify foreclosures, I was completely floored. 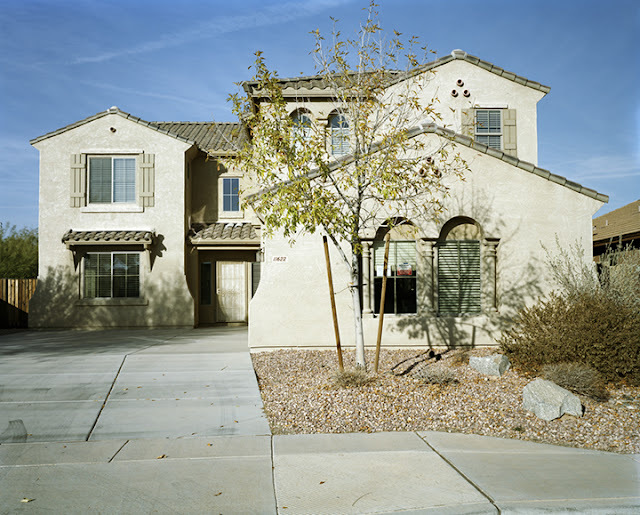 I started to travel to photograph homes and began to see how pervasive this housing crisis was — there were foreclosures in new communities, old communities, seemingly stable communities, poor communities. It was and still is everywhere. 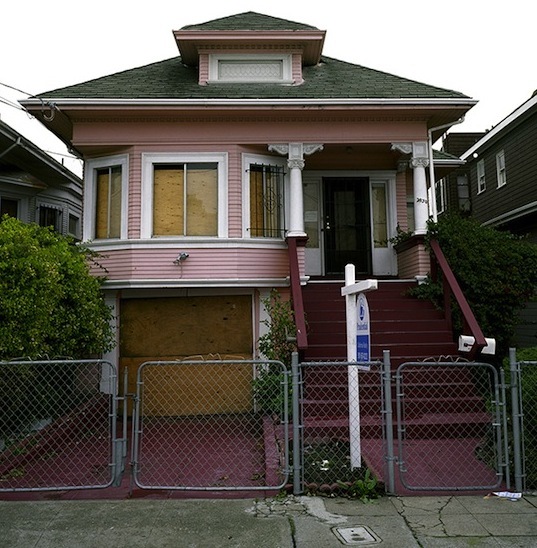 An Oakland foreclosure photographed in 2008. The housing crisis continues to impact cities and communities across the nation. I felt that by documenting the homes and showing the geographic span — from Sun Belt to Rust Belt, from East Coast to Midwest to far West — I could shed some light on the tremendous reach of this crisis. I hope the photographs bring the crisis closer to public consciousness and generate dialogue about what has happened. Home is such a widespread symbol of stability and comfort, there's something especially tragic about seeing an empty house. What will become of the hundreds of thousands of them, and how will their vacancy alter surrounding communities? Did you come across any rays of hope during the process? There is some encouraging work being done. Phoenix is putting resources into developing public transportation downtown and encouraging people to move to the center from the suburbs. Cities like Detroit and Cleveland are converting vacant land into urban farms, encouraging community investment and healthy and affordable food sources. Housing organizations in cities and suburban communities across the country are purchasing empty homes, rehabbing them to green standards and making them available at lower cost through Neighborhood Stabilization Funds. In Cleveland there is a fantastic data resource being used to identify potential foreclosures and prevent them, for example, through mortgage counseling and loan modification. What would you like to express through your house photographs? I hope the humanity comes across in the house portraits, and the tragedy of what happened. I hope viewers will spend time looking at these homes and reflecting on their personal feelings about home and stability. And I hope the work contributes to and encourages dialogue about the crisis. The American Dream has been shattered for so many by sub-prime mortgages, shady investor activity and foreclosure. Recently I watched a video of Elizabeth Warren's pointed questioning of bank regulators. She presses them about whether they've ever taken a major Wall Street institution to trial rather than negotiating a settlement for breaking the law. She points out that the banks pay their penalties from the very money they made illegally. There needs to be more of this questioning, more action taken against banks for abusive practices, and more solutions that prevent people from going into foreclosure and losing their homes. In Phoenix, one of the Sunbelt cities hit hardest by the foreclosure crisis, more and more houses in large, new subdivisions are now abandoned, bank-owned or up for auction. What kinds of reactions have you encountered? When I'm photographing, people often approach me and ask if the house has been sold, mistaking me for a real estate agent or bank representative. I tell them about the project, and people tend to open up and tell me how many homes in the community are in foreclosure and how sad it is. Or they stop and take a closer look at the house, remark on the architecture and express hope that someone will move back in. If the house is really falling apart, they say it should be torn down. I've only had one upsetting incident. I told a curious couple in Phoenix about the Neighborhood Stabilization Program and how foreclosed homes were being sold at affordable rates for lower- and moderate-income working families. The couple expressed concerned about who these people were and how it would change their community. I think I really shook them up with this news. Community development organizations promote the program as a way of making neighborhoods more racially and economically diverse, but clearly there are those who find this threatening and want to keep things homogeneous. After people view the prints, they often share stories about the crisis in their communities. People also ask if I ever speak to the homeowners, but I don't because by the time I'm photographing they're long gone. How do you compare this work to that of photographers who documented the Great Depression for the Farm Security Administration? The Farm Security Administration provided funding for photographers and writers to report on the plight of poor farmworkers, out of which came the great works of Dorthea Lange, Walker Evans and others. The Fed, HUD and NeighborWorks America are also working toward solutions to economic crisis and supporting a variety of efforts across the country. The videos I make for them are shown at conferences and other venues to generate dialogue and highlight productive efforts. My photographs are an independent project. The video work takes me to these locations and provides access, but I'm not getting direct government funding to make the photographic series. A decaying house in Detroit's Brightmoor neighborhood, where there are many vacancies that end up burnt-down or bulldozed. Walker Evans is a big influence. I love his photographs of home interiors, facades of churches, storefronts and billboards. I've also always loved William Christenberry's pictures of homes, churches and other abandoned structures in his native Alabama. He used a small Kodak Brownie camera and worked in color. And I love Bernd and Hilla Becher's typologies of architecture in Germany — their straightforward approach and the tremendous detail they gain in the image from using a large-format camera. One of my favorite projects on the current foreclosure crisis is Bruce Gilden's "Foreclosures" series for Magnum in Motion. He's been to Fort Myers, Detroit, Fresno, Las Vegas and Reno. These are incredibly moving, artful, devastating multimedia stories. I highly recommend his essay on Fort Myers. Which aspect of this project left the greatest impression on you? I think what really struck me was how quickly a neighborhood can decline when homes go into foreclosure. This is why I chose to focus on the facade, which is all we see when walking or driving through these neighborhoods. When the plywood goes up over the windows of even one home, the decline begins and quickly spreads down the block and to surrounding communities. Vacancies encourage crime and impact housing values. The empty house becomes an "eyesore" and contributes to fearful perceptions of the neighborhood. I didn't realize how extensively this crisis is unraveling neighborhoods and undoing years and years of community development in cities across the U.S. It is deeply tragic — people are losing their homes, and the vacancies are bringing additional social problems that will take years to solve. Credits: Photographs appear courtesy of Eve Morgenstern. These pictures are very captivating. You call them portraits for good reason. Would love to see the houses reanimated with people through the neighborhood stabilization program, although sadly I can understand the couple's concern about how the neighborhood might change. It's not necessarily intolerance of diversity to worry about who your neighbors will be. But I hope in most cases these fears are unfounded. beautiful, simply beautiful and sad. I worked for a nonprofit based in a house Built in the style of the Oakland house pictured above. These photographs give beauty to a sad situation. such rich and beautiful images that lead in so many different directions.